A place mentioned in II Kings iv. 42, and in the Talmud (Sanh. 12a). Eusebius identifies it with Baithsarisa, 15 Roman miles to the north of Lydda. 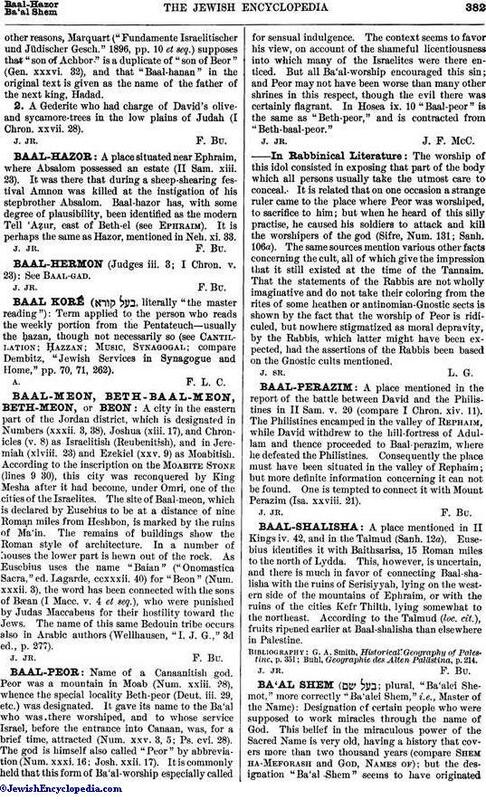 This, however, is uncertain, and there is much in favor of connecting Baal-shalisha with the ruins of Serisiyyah, lying on the western side of the mountains of Ephraim, or with the ruins of the cities Kefr Thilth, lying somewhat to the northeast. According to the Talmud (loc. cit. ), fruits ripened earlier at Baal-shalisha than elsewhere in Palestine. Buhl, Geographie des Alten Palästina, p. 214.